Serbia will hold early parliamentary elections on 16 March, to coincide with local elections in Belgrade. The EU accession talks, which Serbia started last week, are expected to feature high in the campaign, EURACTIV Serbia reports. Early elections were confirmed last weekend after the ruling Serbian Progressive Party backed the idea. The party leader, Aleksandar Vu?i?, who is also first deputy prime minister in the current government, opted for early elections only days after Serbia started membership talks with the EU, on 21 January. Serbia's strongest party cited the need for legitimacy in carrying out necessary reforms as the main reason for holding the vote. "Serbia can do better, more and quicker and changes cannot wait," Vu?i? told fellow party members on 26 January. "We do not have a second to lose because people live in difficulties, young people do not have jobs," he said. Vu?i? said the leader of Serbia's Socialist Party, Ivica Da?i?, was not a bad prime minister, but that there were certain limitations and an atmosphere in Serb society that prevented the speedy carrying out of reforms. Directly before the decision was announced to schedule early elections, the minister for commerce, Saša Radulovi?, resigned because of the government's decision to withdraw draft laws on privatisation and labour reform. Radulovi?, an independent economist, had conditioned his government participation to the quick adoption of these laws, saying reforms could not wait. The draft labour act, which envisaged cuts in social benefits and more flexible rules to hire and fire, especially in the public sector, was fiercely criticised by trade unions. The new election agenda primarily serves the interest of the ruling Progressive Party, whose popularity is growing. The Socialist Party of Serbia, the smaller partner in the current coalition stands to lose the most from the elections and was against holding an early vote, claiming it could slow down reforms. Prime Minister Da?i? stated on Sunday (26 January) that he nevertheless backed the decision to hold an early vote. "I never thought of obstructing this decision," Da?i? said. "We should do our maximum for the early elections not to jeopardise the reforms in Serbia, the negotiations with the EU and the dialogue with Kosovo," he added. While the Socialists face an uncertain outcome, the elections will give the Progressive Party an opportunity to strengthen its political position. Over the past weeks and months, officials repeatedly stated in public that the Progressive Party should hold the prime minister's office. Vu?i? has a unique opportunity to win the majority that would enable him to form a government with the support of only a few junior partners. The Serbian Progressive Party, which has taken steps towards solving cases of crime and corruption and whose rating is just over 40%, has taken power at the local level in all major cities, including the transitional administration in Belgrade. The party has control over most of the media and the opposition is disorganised and currently harmless to Vu?i? and his partners. However, Vu?i? pointed out that the decision on the elections was not made in order for the Progressive Party to win absolute power, and stressed that he could have become prime minister without the election, since Prime Minister Da?i? offered him the position. The decision to hold early elections represents a huge risk, Vu?i? warned, predicting a difficult campaign that would provide an opportunity for the opposition to unite against the Progressive Party. The biggest opposition party, the Democratic Party, which is in deep crisis, believes the decision to hold early elections reflects the government's inability to reform, and said it was ready for the campaign. Serbia's EU membership talks will certainly feature high among the topics in the election campaign. The European integration process has huge importance in the public opinion, especially for pro-European voters. Ruling parties will be able to claim that EU talks started during their mandate, and that many reforms were carried out to enable the start of negotiations. Moreover, the economy is still on its feet: although the crisis is serious, the state is still able to pay pensions and salaries to the army and of employees in the public sector. As long as this lasts, no major social unrest is expected. The conservative Democratic Party of Serbia is against the EU integration process. Its leader, Vojislav Koštunica, said he expected the early elections to determine whether Serbia would remain a free country, or “a puppet state of the European Union”. Parliamentary elections have been held five times since the fall of the regime of Slobodan Miloševi?. Early elections were held in 2000, 2003 and 2008, and regular votes were held in 2007 and 2012. 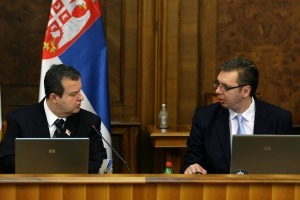 Serbia held joint parliamentary, presidential and local elections on 6 May 2012. The coalition led by the Progressive Party of Tomislav Nikoli?, who won the presidential election at the run-off, won the parliamentary election with 24.07% of the vote and 73 seats in Parliament. The coalition of Boris Tadi? 's Democratic Party arrived second with 22.11% and 67 seats. The coalition of the Socialist Party of Ivica Da?i?, which also includes the Party of United Pensioners, won 14.53% and 44 seats, while the Democratic Party of Serbia of Vojislav Koštunica obtained 7% and 21 seats. The coalition of ?edomir Jovanovi?, leader of the Liberal Democratic Party got 6.52% of votes and 19 seats, and the United Regions of Serbia of Mladjan Dinki? got 5.49% and 16 seats. Following his election as President of Serbia, Tomislav Nikoli? stepped down as leader of the Progressive Party and Aleksandar Vu?i? was elected as his successor. 16 March 2014: Parliamentary elections in Serbia, to coincide with local elections in Belgrade.